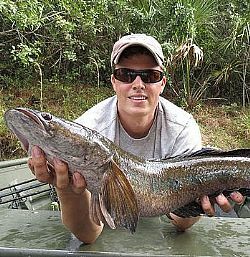 The Florida Fish and Wildlife Conservation Commission (FWC) plans to crowdsource data on nonnative freshwater fish species in Florida by partnering with the U.S. Fish and Wildlife Service (Service) and Fishbrain – the world’s largest app and social network for anglers. The FWC has provided a list of nonnative species of interest in the Sunshine State, which will equip Fishbrain’s users with the necessary information to log sightings of these species when they come across them. Florida is the pilot state to use Fishbrain technology in order to help land managers better understand the extent and impact of nonnative aquatic species. Following the Florida campaign, Fishbrain and the Service hope to build on the pilot project in other areas of the country through partnerships with state conservation organizations. With a better understanding of the extent of these species in the environment, resource managers will be able to develop effective tools designed to monitor nonnative species and prevent them from further damaging the biodiversity of ecosystems across the nation. The Fishbrain app allows users to log catches by recording the location, time, species and a picture of their catch. Starting Dec. 20, the FWC will invite the 250,000 Florida-based users of the Fishbrain app to log catches of 15 different types of nonnative fish in the Florida ecosystem. The FWC promotes the consumptive use of these exotic fish instead of releasing them back into the wild.